Lookout Pass is a friendly relaxed ski mountain with the lion’s share of snow in northern Idaho, in Mullan on the Montana border. Located 90 minutes from Spokane or Missoula on I-90, Lookout is very close, just 22 miles, to Silver Mountain in Kellogg Idaho. Lookout Pass is blessed 400” of light, dry powder earlier and more often than any other Idaho ski resort, as confirmed by the US Forest Service and NOAA, and us at Family Ski Trips. Lookout’s northeastern facing ski slopes are protected from the wind and sun, offering soft snow on its 3 dozen runs plus bounteous powder glades. 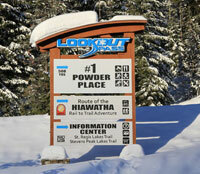 Lookout is popular with locals, and families, for its $40 weekend lift tickets, kids six and under ski free. You can ski the Idaho side, the Montana side and the North Face – each is served by an old school but reliable double chair, spreading out the few skiers and contributing to the mellow homey vibe here. Lookout’s Front face is called the Idaho side – with beautiful groomed trails like Gold, Silver and Copper, a centerpiece terrain park and some playful glades. Skiing off Lookout’s back side you are on the Montana side skiing long well-pitched runs like Keystone and Cloud 9. – and you don’t need to change your watch from Pacific to Mountain time as you cross state lines. Lookout’s Northside, back in Idaho, delivers steeper runs like Purgatory and Hercules with well protected soft natural snow. Powder hounds love these trails. Kids love Lookouts’ three terrain parks -Borderline, Rolling Thunder and Huckleberry Jam. And we have to give a shout out to Lookout’s gorgeous grooming – surprisingly smooth soft corduroy for a rather humble ski hill. Lookout Pass started humbly in 1936 as Idaho Ski Club, with a rope tow powered by an abandoned car’s engine found on the old Yellowstone Highway, which is now I-90. While the kids keep skiing, you have to have an après ski beer in The Loft, upstairs in Lookout’s historic Lodge which was built in 1941 by the CCC, the 2nd oldest lodge in the Pacific Northwest, after Timberline Lodge in 1936 on Oregon’s Mt Hood. A slope view and great Lookout ski memorabilia make this a classic ski lodge bar. The Idaho Ski Club sold the ski area in 1992 to a local group to become Lookout Pass Ski Area. 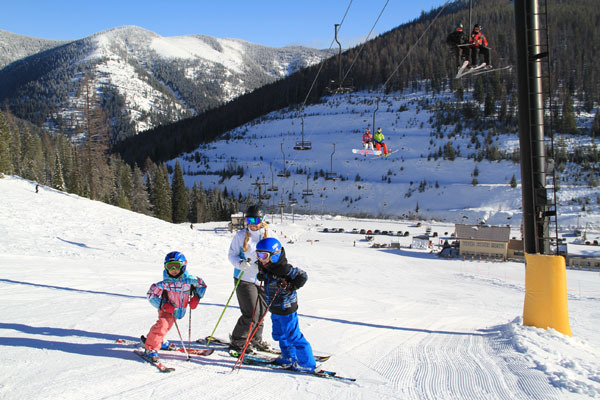 In 2007 the North Star double chairlift opened up expert terrain on the prime north aspect of the mountain with beautiful views down toward the Coeur d’Alene River Valley. Lookout Pass has big plans, having receivedU.S. Forest Service approval for a long-range plan to expand 2,000 acres on two 6,200’ peaks with two double chairs and 1,400’ vertical on Eagle Peak that straddles the Idaho/Montana border. For lodging when skiing Lookout Pass, the nearby Silver Valley offers hotels, motels and resorts. We recommend staying and skiing a day or two at nearby Silver Mountain Ski Resort in Kellogg Idaho or heading to Schweitzer Mountain Resort and the town of Sandpoint on Lake Pend Oreille. We hesitate to share Lookout Pass with you since its such a cool snowy stash – but there you have it, check it out along with Silver Mountain and ski Schweitzer in Idaho.